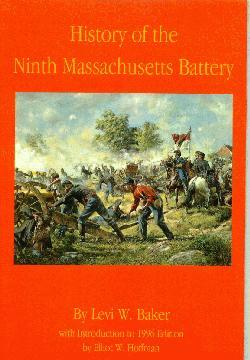 The Ninth Massacusetts Battery, also known as Bigelow's Battery, earned a place in history on July 2, 1863, when it fought a delaying action against the Confederate infantry at the Peach Orchard and the Trostle Farm'e barn. Read the history of the battery as it fought with the Army of the Potomac in Gettysburg and Petersburg. Levi Barker did an outstanding job of chronicling the history of this legendary artillery unit. We present it to you as it originally appeared and we hope that you enjoy it. Monday, the 29th, about 9 A.M., the column started through Walkersville and Woodsboro, and camped near Middleburg at 8 P.M.
July 2. Rumors of fighting reached us the day before, and when we again took the road north we soon began to meet trains and men coming back, saying there had been fighting the day before, and would be more. About l0 A.M., we could hear the occasional discharge of artillery; we soon came in sight of bursting shells. A little in front of us a caisson blew up, killing one man, tearing his face entirely off. As we passed up on the Taneytown road to Gettysburg we left the Round Tops on the west, bringing the fighting on our left. We turned to the right, through those narrow and rough roads, and again to the right, into a field west of Spangler's barn, going in park before noon. The firing seemed to be from the south toward the north, but occasionally a shell would come towards us burstingshort; the Taneytown and Emmittsburg roads being at this place about one and one quarter miles apart, and we were one half mile east of the Taneytown road,. Spangler's barn was taken for a hospital, and a large number of Rebel wounded were there; some of the boys went there and saw them. Our teams were watered, not more. than one or two batteries being unhitched at one time. We were soon fed, and dinner eaten, and we watched the increasing artillery fire. Thus passed the time till about 4 P.M. Our place in the park was on the left and rear, and in the southwest corner of the field, nearest the part of the line of battle occupied by Gen. Sickles' 3d Corps. A little after 4 P.M., an aid-de-camp rode up to the wall near the left piece of our battery, and enquired for Col. McGilvery, commanding the brigade, and said, "Capt. Randolph, chief of artillery of the 3d Corps, sends his compliments and wishes you to send him two batteries of light twelves." Col. McGilvery turned, around and said: "Capt. Hart and Capt., Bigelow, take your batteries and report to Capt. Randolph." At the order "Attention," we all sprang to our places and cleared our guns of grain, for action, and immediately filed out of the field at the corner nearest to us. We skirted fields, followed by-roads, and halted in a field southeast of Trostle's house. We were ordered, to double up, I suppose to gain time in starting. Shells were flying over our front, and bursting in the air. As we sat waiting for orders, Lieuts. Erickson and Milton asked permission to ride to the line of battle; the Captain, bowing assent, turning to Lieut. Whitaker said, "They will see enough before night." As this was the first time that most of us had been under fire, the experience was new and untried; but we were all calm and many realized that perhaps it was the last time we should be all together. One man went to another from the same place and said, " Sergeant, if I am killed, I want you to get my watch and money, and send to my wife; and there's seven dollars that F. owes me, get that, too." But he escaped unharmed, the sergeant wounded, and F. killed. Soon the order was "Forward," and we filed into a lane by Trostle's house, then turned to the left through a gateway. Before the left piece was through, the order rang out: "Forward into line, left oblique. Trot!" and before the left piece was in line, "Action front! " The distance across the field is about 300 yards, up a gradual slope to a road so little traveled as to be marked by fences more than anything else. The right piece was about ten yards back from, the road; the left piece was in the road (fences were all down). As the Captain rode down the line he found the left section so far down as not to be able to sight their guns on anything. He ordered, "Left section limber to the rear; by the left flank, march!" and on the right of the lire went in battery; so that our line during the engagement was as follows from the right: fifth piece, sixth, first, second, third, fourth, and the lieutenants were on the right, Whitaker, then Erickson, and Milton, who was in command of the centre section (Lieut. Foster being in Massachusetts), and Quartermaster Reed in charge of the line of caissons. Our position was between the Peach Orchard and Wheat Field, on the left of the 5th Massachusetts Battery, and nothing in sight on our left.The position was swept by Confederate artillery, and some were wounded while going in battery. Our first orders were to shell a piece of woods which concealed three batteries of eighteen guns. What effect our firing had on them we do not know; but their fire seemed to slacken somewhat. Very soon we were ordered to shell Rose's barn to dislodge some sharpshooters. It has been a current report among our battery members that we killed over one hundred men at this place, and one field officer. In a letter of Gen. L. McLaws, dated Oct. 7,1886, he says: "Col. McGlosbein, 50th Georgia Regiment, of Semme's Brigade tells me that his regiment lost one third of its men by artillery fire, including its commander." The time and place indicate this time and place. This shelling greatly aided the brigade that were in the woods in front of the Wheat Field, in which were the 18th and 22d Mass. Regiments. Kershaw on the right and Barksdale on the left moved out together, and broke Sickles' line at Peach Orchard; then Kershaw inclined to the right and Barksdale to the left, and when they appeared in our sight, Kershaw's left flank was on our right front; Barksdale's right was on our right flank. Kershaw having passed the Peach Orchard, halted to reform his lines about 700 yards distant. Col. McGilvery ordered us to shell them, and it was a fine target, and the case shot burst finely in their front. They were in two lines of battle and must have suffered from our fire. They threw out a heavy line of skirmishers against us, forming a solid single line covering our battery front, after we commenced to retire by prolonge. The skirmish fire was very sharp and we were losing heavily. Col. McGilvery ordered Capt. Bigelow to "limber to the rear and get out." He replied, "I shall lose all my men in limbering up, but would retire by prolonge instead." As we commenced retiring, Barksdale's brigade emerged from the Peach Orchard about 400 yards on our right, and halted to reform their lines. Capt. Bigelow says, "I directed Milton (left section) to keep back Kershaw's skirmishers with canister, and Erickson and Whitaker to throw solid shot into Barksdale's lines." To keep clear of our fire, Barksdale moved well to our right, the greater part of his men going west of Trostle's barn, while the 21st Miss. Regiment (Humphrey's) was detached and came down the road on our right and front. The line of the regiment was so long that Capt. Bigelow thought it was a brigade. As the recoil of our guns brought us to the rear of the field, we were somewhat troubled in working our guns by large bowlders and the stone wall on our left and rear. Capt. Bigelow says: " Just as I was limbering up to go through the gateway and back to the ridge in my rear (Cemetery Ridge proper), Col. McGilvery dashed up and said, "Captain Bigelow, there is not an infantryman back of you along the whole line from which Sickles moved out; you must remain where you are and hold your position at all hazards, and sacrifice your battery, if need be, until at least I can find some batteries to put in position and cover you. The enemy are coming down on you now.' I immediately ordered the guns unlimbered, the ammunition taken from the limbers and laid beside the guns. Hardly were the four guns double-shotted before the enemy appeared above a swell of the ground about fifty yards on my right and front. I became heavily engaged." The situation was not one an artillery officer would have chosen, as the ground on our front and right was much higher, and we could not see more than fifty or sixty yards in those directions; neither was there room enough to work six guns at usual intervals; and the ground was broken by bowlders, with heavy stone walls in our rear and left, with a gateway about in the rear of the second piece from the right. As soon as the enemy appeared over the ridge, they were received with a vigorous fire, some of which was with double canister; but they were too near the prize to be stopped, and pressed on and received our fire not six feet from the muzzles of our guns. Then our cannoneers were driven at the point of the bayonet, and were shot down from the limbers. Soon after they appeared, Capt. Bigelow was shot and fell from his horse; Lieut. Erickson was already wounded, and was hit again and fell dead near the right gun, and his horse went into the enemy's lines. Lieut. Whitaker at this time was shot through the knee, but kept his seat and rode off the field; Sergt. Dodge also fell here mortally -wounded; Sergts. Murray, Fenton, Hirst and Baker were all wounded and were helpless for duty. Capt. Bigelow was raised up, and saw the enemy that came in on our flank standing on the limbers shooting horses, and men, still serving their guns. But Col. McGilvery was ready, and he ordered, "Cease firing, and get back to our lines as best you can." Most of the wounded men who could, had left the field; beside the instinct of self-preservation, some wished to relieve their comrades of caring for them. Capt. Bigelow's horse had run away when be fell; he was lifted on his orderly's horse, and started for our lines nearly the way we came in, and encountered Watson's Battery (I, 5th U. S., probably) just in position. They called to him to hurry up, as they wished to open fire. He says, "I could not, and told them to fire away, which they did." On their right, Col. McGilvery had placed the 5th Mass., 6th Maine; K, 1st N. Y.; B, 1st Penn. ; 2d Conn.;15th N. Y., Ind. ; G, Penn. ; C, 4th U. S.; and Rority's B, 1st N. Y. (Batchelder's Map). The left section had been busy with Kershaw's line of skirmishers, and being farthest from the enemy on our right flank, they did not suffer so much in their horses or men, and when the final order came, they had nearly whole gun teams. A few top stones of the wall were toppled off, and the teams went over; one gun partly overturned, but was righted by the aid of men from other pieces. The situation at this time was as follows : The right gun, the fifth, horses all killed and left fifty yards up the slope ; one driver killed; sergeant and gunner wounded and gone; two cannoneers wounded and one lying under the gun. The next gun, all but one horse killed; sergeant wounded twice; one cannoneer shot through the body, lying in the enemy's lines; one other bruised in the back; the limber overturned near the gateway. The next two guns, one sergeant mortally wounded, the other hit in the foot; five men killed, two wounded; all horses killed. The left section lost one sergeant wounded and one man wounded; gun teams with some wounded horses, but all went off the field. As one lieutenant and one sergeant were absent, Quartermaster Reed volunteered to take charge of the line of caissons and was hit in the neck. Also Stable Sergeant Lowell, on hearing that the boys were having a hard time mounted and rode to the field, and tendered his services to the Captain; he also was lying under his horse, which was shot. KILLED. Sen. First Lieut. Christopher Erickson. Sergt. 2d gun, Charles E. Dodge. Private 1st gun, Henry Fen. 1st Adolph Lipman. 1st Charles B. Nutting. 2d John Crosson. 2d Arthur Murphy. 5th James T. Gilson. WOUNDED. Capt. John Bigelow, hand and side. Jun.1st Lieut. Alexander H. Whitaker, knee; died July 20. Quartermaster Sergt. James W. Reed, Jr., neck, slight. Sergt. 1st gun, George Murray, foot, severe. 4th John L. Fenton, knee; died in Baltimore, July 28. Sergt. 5th gun, Joseph Hirst, arm, severe. 6th Levi W. Baker, hip and shoulder, twice, severe. Gun'r 5th Augustus Hessie, arm, severe. Pri. 5th J. K. Norwood, lungs, severe. IC 6th John B. Stowe, lungs, severe. It 1st Samuel W. Barnard, leg, severe. 5th Louis Langeleer, leg, severe. 3d John A. McCarty, leg, severe. 1st Austin Packard, wrist; died Sept. 20, 4th Charles Downing, slight. 3d James McDavitt, slight. Guidon, Thos. Fisher, slight. PRISONERS. Gunner William L. Dawes, escaped. Private Samuel Toby, exchanged.